Parents, other family members, and teachers are often well placed to recognize whether a youth may be suffering from a mental health problem. However, it is not always easy to differentiate between normal ‘teen angst’ and something that could be more serious. Set out below are websites containing resources and information to support families and teachers of youth who may be experiencing a mental health problem. Many of these sites include information on potential warning signs as well as tips on talking to youth about mental health. If your child or student is having a mental health crisis you should seek help urgently by calling 911 or going to your local hospital’s emergency room. Confident Parents: Thriving Kids is a family-focused coaching service effective in reducing mild to moderate behavioural problems and promoting healthy child development in children ages 3-12. The program is offered at no cost to BC families, and coaches are available to meet with parents during day, evening and weekend hours to meet each family’s needs. Find information and resources on topics related to mental health challenges affecting youth and young adults. Directory of publicly-funded health, mental health, and addiction treatment programs accessible to British Columbians, including the organizations providing the programs and the sites where they are offered. Committed to providing, and continuously improving, a continuum of services for individuals and their families who are living with addictions and mental illness. Provides a wide range of mental health and substance use services. Programs are designed to support clients in their recovery. Information about mental health and substance use and help for yourself or a loved one. Provides contact numbers and a mental health service directory. Find mental health services in the hospital or in the community. Helping families, and those connecting with them in communities and across systems, to identify and act earlier upon what is meaningful for families, and what works to improve child and youth mental health and wellbeing. 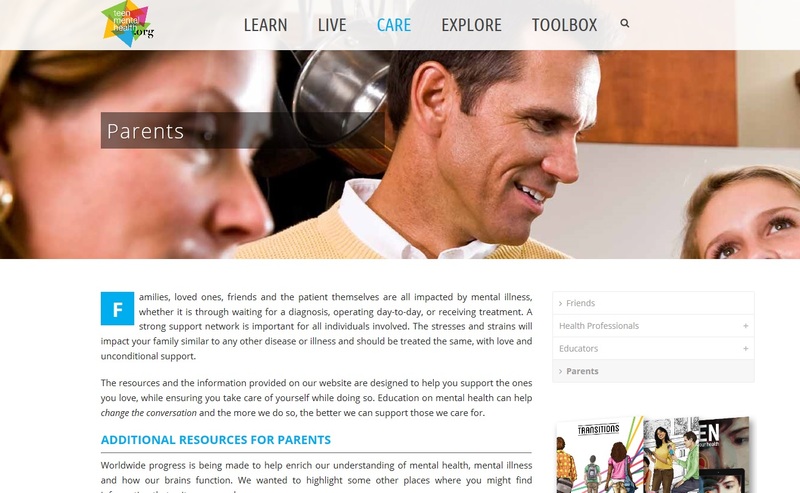 Provides a resource manual for families dealing with mental illness as well as helpful links, and family-focused support groups. Answers your questions about depression, helps you recognize it in others, and learn how to talk about it. Providing help to better prevent and manage mental health and substance use problems and live a healthier life. Learn about the different forms of mental illness and their treatment. Find valuable resources for medical advice and community support services. Love our bodies, love ourselves! Aims to bring awareness to the public in preventing eating disorders and building self-esteem with a positive body image. Aims to improve mental health literacy and provide the skills to help people better manage developing mental health problems in themselves, a family member, a friend or a colleague.